If I was a model, I’d be in amazing shape right now. It would be really easy because it would be my job. I’d have nothing else to do all day except workout and eat the meals handed to me by my nutritionist. I leaned on this belief for a good few years and I wasn’t alone. In conversations with my friends and colleagues we’d all agree that there was no time to exercise whilst meeting the demands of a challenging career. For actresses it’s their job to be in shape, my job is to be at a desk. If I was in the public eye I’d be able to afford a personal trainer and it would be easy. This of course is not true. Though I only really accepted that this year; a year that’s subsequently seen my body fat % drop from 20.2% to 17.2%, and the truth is that it was no harder for me than it is for Gigi Hadid, Hugh Jackman or Madonna (in fact it was easier for me because I’m not in such good shape). But why did I do it? Winding back a few years to my first role in marketing. My hours quickly started creeping up and going to the gym in the morning became increasingly less appealing, at times seeming impossible. The expectations also made me less committed to my diet. I felt as though, if I was working really hard, I needed to get through the days however I could and if that meant extra toast, then I would have the extra toast. If that meant doing a 3pm team brownie run then TO THE DELI. One of these hectic days there was an external speaker visiting the office. Her name was Abigail Posner and she had the grand title ‘Head of Strategy’ for Google’s brand division. She was very smart, very successful, very observant and… in great shape. I mean, wow girllll. She wasn’t living off PBJ sandwiches and iced frappuccinos. She was slim and athletic which gave her this aura of power beyond what the Google tag did. This happened to be around the time women in the workplace were buzzing about Sheryl Sandberg’s Ted Talk and related book: ‘Lean In’. As I watched Sheryl’s talk (beyond the sharp observations she made…) I couldn’t help noticing that she too was in great shape. 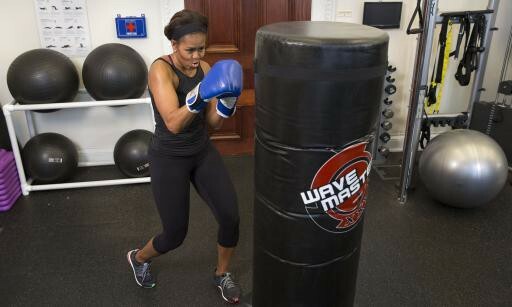 She’s the COO of a multi-billion dollar media empire and she finds time to maintain that physique. I was intrigued. How could I, a fairly junior manager in an advertising agency, be busier than these leaders from Facebook and Google?! As I started to look further for remote mentors, successful women I could study the habits of, these were some of the people who jumped out at me: Michelle Obama, Marissa Mayer, Jessica Alba, Anna Wintour. These are powerful women with very hectic schedules. Women whose day-to-day jobs in themselves don’t involve being critiqued in swimwear. Yet they’ve found a way (and will) to be disciplined with both diet and exercise. Tom Corley, who wrote ‘Change Your Habits, Change Your Life’ found that 76% of the rich people he researched exercise for at least 30 minutes a day. Similarly, Tim Ferriss who has written multiple books on the habits of the world’s most successful people found regular exercise to be one of the most common consistencies amongst his interviewees. OK, so eating well and exercising might make me sharper but that doesn’t help with the all important question of time. How and when are you supposed to fit it in?! For me, it had to be the morning. Plan to exercising in the evening and you’re reducing the likelihood of making it. Your day can get hijacked, your energy and willpower can go elsewhere. To be able to go in the morning, you just need to be disciplined about bedtime. Of course everyone is different but this technique seems to have the highest success rate. How are some of those successful people I mentioned doing it? Editor in Chief of Vogue magazine, Anna Wintour, plays tennis for half an hour every morning. Jess Cartner-Morley at The Guardian reported that Anna wakes up every morning at 5:45 a.m. to play tennis before her daily hair appointment at 6:45 a.m.
Starwood Hotels & Resorts’ CEO Frits van Paasschen, recently completed the Ironman triathlon, which consists of 2.4 miles of swimming, 112 miles of cycling, and a 26.2-mile run. The triathlon took the exec just under 13 hours. And then there’s Jeff Bezos… The founder and CEO of Amazon, who last year had the title “Richest person in the world” (Business Insider), recently got chins wagging as he stepped out in a polo and revealed some pretty sizeable biceps. The specifics of his regime aren’t known but no amount of money bought that body. It comes through discipline and weight training. So going back to my opening statement about how being in good shape is a model’s job. Is it really their job? Isn’t their job, the bit they get paid for; the photo shoots and the catwalks. The process and financial investment which goes into their bodies is really the enabler; the steps necessary for them to be paid to do their job. Might it be the case that prioritising exercise, making it a must not a maybe, will make the difference to your ability to do your job as well? PreviousSo you want to be Beyonce? Well, you can be.